The opening of Ori and the Blind Forest reminds me of the opening sequences in Up! and Wall-E. Even though there's no spoken dialog and a minimum of narration, the opening carries a lot of emotional weight and gives you a good understanding of the personality and motivation of the story's central character. It's a testament to the strength of the game's storytelling that your quest to save the forest doesn't even start until about ten minutes after you first start the game, and you really don't notice that that much time has passed before you do begin actually playing the game. 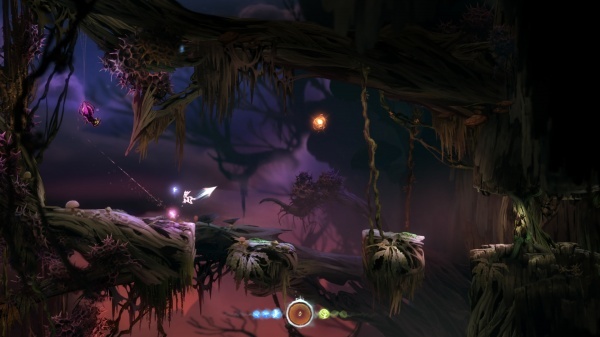 In the game's story, Ori is a cat-like forest spirit born of the Spirit Tree during a storm who is found and cared for by a gentle creature of the forest. Their life together is happy and idyllic, until one day the Spirit Tree is corrupted by an evil forest and the forest is turned 'blind' as a result. Soon thereafter, Ori is met by another forest spirit, Sein, who serves as a guide to Ori as they set off together to save the Spirit Tree and return life to the forest. The game itself is a 2D puzzle platformer that's a lot heavier on the platforming than the puzzle solving. Exploration is central part of the gameplay as you look for hidden bonus items and the keys that will unlock the doors that bar your way. You'll also often come across areas or pathways that are inaccessible because you lack the necessary skills to reach them. The game hands out skills like wall-climbing and double-jumping only after you find special shrines that bequeath these skills to you. The beautiful environments in the game belie just how dangerous a place the Blind Forest is. Dangers abound, both in the environment and in the creatures that inhabit it, and it's quite easy to die and to die quite often. The quick reflexes and platforming skills the game requires may make it a bit much for the casual gamer or the easily frustrated. Not that the game is ever overtly unfair or unbalanced, it just pushes your skills and makes you pay for your mistakes. To mitigate the difficulty a bit, the game uses a dynamic save system that lets you create save points anywhere, and then uses your last save point as the respawn point after you die. Being smart about where and when you deploy these save points can be a big help in getting you through some of the game's more difficult sequences. The business of dispatching enemies is handled by Sein, who resembles a will-o-the-wisp or spark that usually hovers above Ori's head. Pressing the attack button will send Sein at the nearest enemy like a homing missile, so there's no need to aim your attacks. Instead, you'll need to make sure that you're actively dodging enemy attacks, so battles are basically button-mash-and-dodge affairs. The energy dropped by defeated enemies powers the save points that you create as well as serves as a form of experience points. Accumulate enough and you'll earn a skill point that can be applied to one of three skill tracks that will help you customize things a bit to your play style. There were certainly times that I found the game's difficulty frustrating, but those times were always tempered by the feeling of accomplishment once I made it past some of the tougher sequences. I also found it easy to forgive the game after those times, as its charm and beauty quickly put me under its spell again. 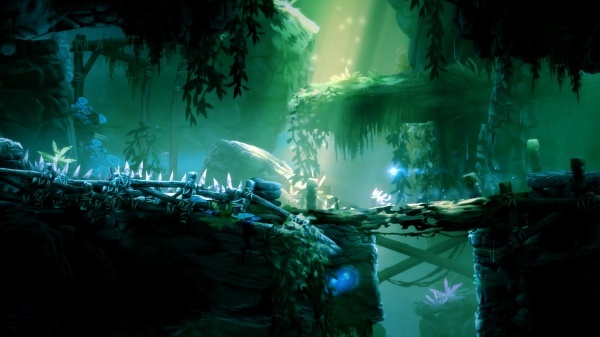 The game's compelling narrative and magical world, and, yes, its challenging gameplay make Ori and the Blind Forest easy to recommend to most gamers, especially if they relish a challenge, and to all of those who can appreciate a well-crafted and beautiful game. Final Rating: 92%. Its beauty belies its difficulty.